What Jeans should I wear? Damarts guide to buying Denim. Smart, casual, flattering and comfortable – the classic pair of denim jeans have it all! So versatile they go with everything and are great for all sorts of occasions – trips to the park, lunch with friends, and evenings out. Jeans really are an absolute wardrobe essential and one pair is never enough! Not sure what style suits you? Check out our guide to Damart’s denim collection and find your perfect pair of jeans! So if you have a Fuller figure, then a higher waist will help to cover muffin tops and stretch denim helps to hold your tummy in. Bootcut styles with a higher waistline will help to balance out a Pear shape and of course, darker denims are always more slimming! If you’re Curvy but with an Hourglass figure, then you’ll look great in straight leg and slim leg styles. Slim fit and straight leg jeans also work well for Apple shapes because they elongate the body – plenty of stretch goes a long way for comfort too. If you’re short then a higher waist will help to make you look taller! And for those with a Straight/boyish figure then go for styles with back pockets that add curves to your hips and accentuate your bottom to achieve a peachy posterior! Jeggings are perfect for Slim figures who will also find lighter washes really flattering. Let’s start with our classic Jeans with elasticated waist and pockets that come in pastel washed blue or indigo. Casual and comfy enough to wear all day long thanks to the stretch fabric, this pair is a wardrobe staple that will go with everything. They are cut with a slim fit, straight leg for a modern look, and with a higher waist and a long length, they’ll elongate your legs too! Another classic style is our 5 Pocket Jeans with a flattering slim leg. So comfortable thanks to added stretch, they are also made in cool, cotton rich fabric which feels great to wear. With indigo and black shades available, these jeans are the perfect pair for an evening out – simply team with a blazer, blouse and heels for a smart outfit in an instant. 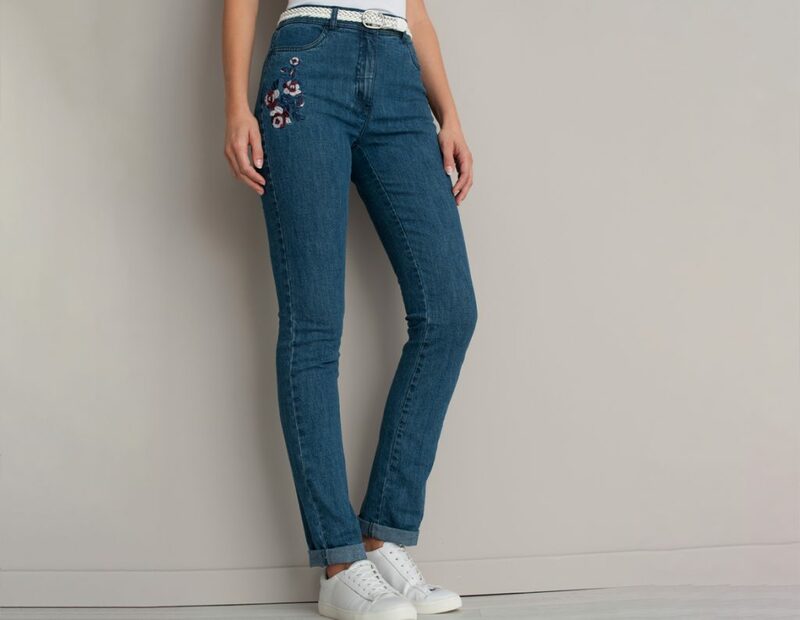 Our Pull-on Stretch Jeans have a relaxed, comfortable fit making them ideal for anything from weekend walks to shopping trips to simply relaxing at home! Simply pull on and pair with anything – knitwear, blouses or t-shirts – for a great casual look. Plus they come in a choice of 5 colours including some gorgeous Spring shades like sage green, grape and airforce blue for a seasonal twist. Every modern woman’s wardrobe needs a pair of fashionable Jeggings! Jeggings are the perfect combination of jeans and leggings, giving you all the comfort of leggings, with the look of denim jeans – our jeggings even feature back pockets. Great for the upcoming Spring season, worn with a lightweight tunic and some wedges, loafers or other slip-on style shoes. embroidered detail for that pretty extra touch. They’ve got a semi-elasticated waist and stretch in the fabric too for your day-long comfort! Always dress to flatter your shape – with Damart’s variety of jeans you have plenty of styles to choose from. Happy denim shopping!